THE MAGIC OF THE BULGARIAN FOLKLORE DANCE CONQUERS THE WORLD! WHY NOT? 1. Establishing the national identity! Bulgarian folklore is the richest folklore in the world in terms of rhythms. 2. Bulgarian folklore dance is one issue which can unite all the Bulgarians in the world. 4. Bulgarian folklore dances with their unique uneven rhythms are not only Bulgarian’s fortune, but world’s as well. 5. The uneven rhythms have positive impact on the human’s health – THE ACTIVE DANCERS DO NOT SUFFER FROM CANCER OR SPINAL CURVATURE! Given a scientific explanation, this news would attract huge interest from the whole world! 6. Establishing new Bulgarian folklore dances clubs around the world – new style in the physical activity of a person, which prevents the spinal curvature and cancers. Let us all celebrate the 24th of May 2015 – the holiday of Bulgarian culture with a traditional Bulgarian folklore dance! Let us all create one video /length 1-3 minutes/ with Bulgarian folklore dance to support this campaign. 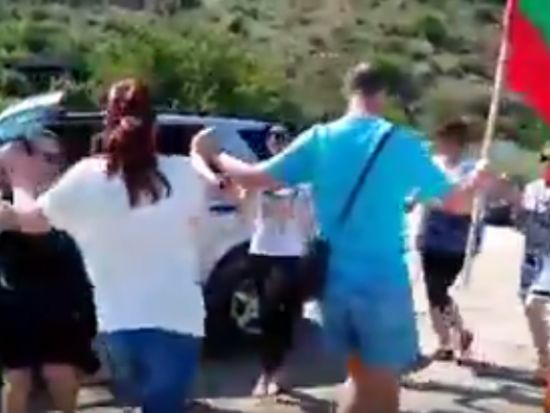 Let us all create a huge media campaign – “Hold on, Earth, Bulgarians are dancing!” Together we can make the whole world look forward to the 24th of May! We would like to invite all the Bulgarians throughout the world and all the friends of Bulgaria!